Of course you can pick and choose your own colors but since I was making this for my baby niece who has a red sakura themed room I stuck with red. The doll was not difficult to do, but some parts like the hands and hair ornaments might require a bit of fidgeting because you have such a small space to work in. I also found that you really need to keep your yarn tension in check when doing the hair part because it should be almost flat like a coaster. If you work to tight the hair will become a bowl-like shape and won’t fit the head properly. I also made a few changes to her pattern for the dress and hands. Instead of doing a tube for the dress, as her pattern suggested, I did a cone and made it out of one piece instead of two. My sister loved the doll and all my friends requested one too. 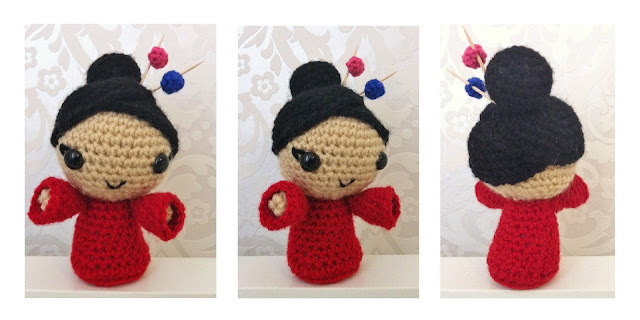 So thank you All About Ami for your lovely pattern! You can find the changes I made to the pattern here.